Getting top listing in the search results is a contest in relevancy, authority and popularity. The objective of search engine optimization and search engine marketing is to bring highly targeted visitors to your website. While SEO focuses primarily on improving your website ranking in the "organic" search results, search engine marketing looks at alternative ways of bringing traffic to your website. This is frequently done in conjunction with traditional advertising such as promotion via banners, signage on your vehicles, printing of your website address on your business cards and brochures etc. Search Engine Marketing is often confused with off-page Search Engine Optimization. While both of them may target the same media (e.g. Video or Article Directories), their purpose is different; SEO is primarily concerned with obtaining links (irrespective of their quality), while SEM with bringing targeted traffic to your site. For example - posting a poor article in an Article Directory will get you a link, but it is unlikely to get you any traffic. The objective of each strategy is to bring visitors to your website and encourage them to take action - to bookmark, to subscribe, to provide contact details or to pull out their credit card and buy. If you would like to learn more about Search Engine Marketing Techniques, our Internet Marketing Tools page and the Blog have a lot of helpful tips and links to resources that can help you in your quest. Participating in Internet Marketing Forums and learning from a reputable internet marketing expert is also recommended. Promoting your website online can be time consuming and it requires a lot of specific skills, which you may not have in house. Many small (and not so small) companies waste their marketing budgets on hit or miss marketing campaigns, that are not only badly planned, but also badly executed. 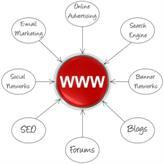 An effective online marketing strategy consists of many components, which work together to produce a desired result. If you don't know what you are doing, you could be paying $5 per click for the same keyword, we would be able to get for half the price. So, before rushing off and committing your resources, it is always best to sit down, look at your objectives and your budget, do some research, review your options and plan your moves. If you need some help in this department, read through our Online Marketing Strategy page. We also recommend that you invest in an Online Marketing Strategy Consultation. Getting professional advice early in the game will help you save money and time in the long run. Online marketing is as much an art as it is a science. There is a saying that in marketing, half of the efforts are usually wasted. The key to success is in knowing which half. For that you need to be able to test and measure just about everything - your headlines, your sales message, even the colors of your site influence how long the visitors stay on your site and whether they buy or not. To get this kind of feedback, you need powerful traffic analysis tools. For more information on your available options, go to our Traffic Analytics page. If you don't have a website as yet, our Web Design Packages include entry-level website promotion and link building. The packages are designed to get your site indexed as fast as possible and propel it in the right direction. If you already have a website, but it is not getting much traffic or does not convert too well, maybe it needs to be re-designed or search engine optimized and promoted. Let us review your website and see what it needs to bring it out of obscurity. Go to Website Review page for see what is involved.